Deutsche Reichsbahn 99.3461, Knebworth Park & Wintergreen Railway, 25 July 1976 1. Vulkan (Stettin) 0-8-0T+T 3852 / 1925. 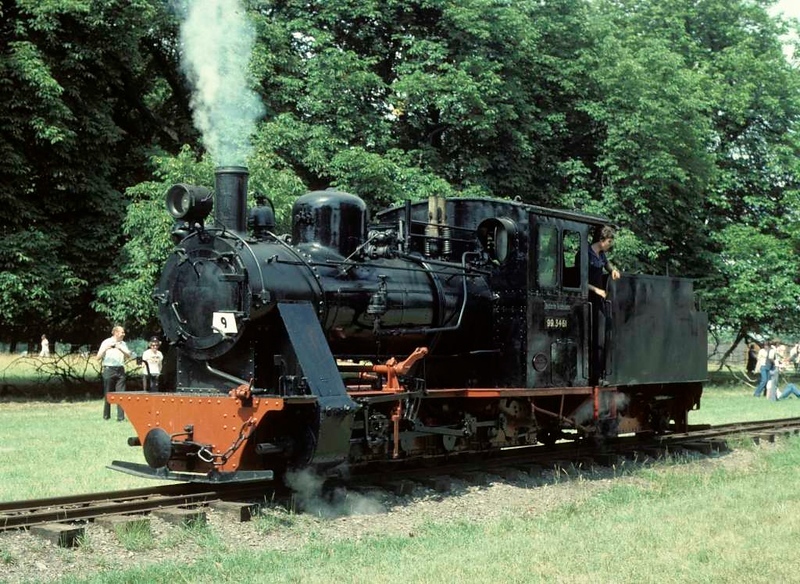 This loco came from the Mecklenberg - Pomerania narrow gauge railway in East Germany, closed in 1969. By 1979 it had moved to the Froissy - Cappy - Dompierre Railway where it is CFCD No 8 - see the last photo in this album. The CFCD runs alongside the River Somme, near Peronne, in northern France - see photos of my 2012 visit in the French trains section of this site. Photo by Les Tindall.